The dancing hot dog meme is back in time for Halloween. You know what time of year it is, guys. Tis the season for novelty internet-themed costumes. 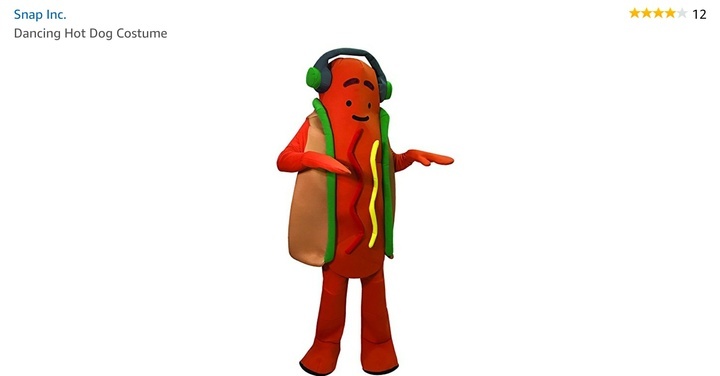 If you haven't already picked out a look for the spookiest night of the year, might I suggest Snap Inc.'s Dancing Hot Dog ensemble? Snap achieved viral success this year with the dancing hot dog meme, aka the gift that keeps on giving. It's clear that the dancing hot dog touched our hearts in ways that we may never know. So, for a cool $79.99 you can BECOME one of the year's most beloved memes. The costume is described as an "easy 2 piece fit: Hot Dog Tunic with attached sleeves and hands, and pants with attached shoe covers". I can't believe I reached adulthood and I'm only just reading the phrase "hot dog tunic" for the first time. 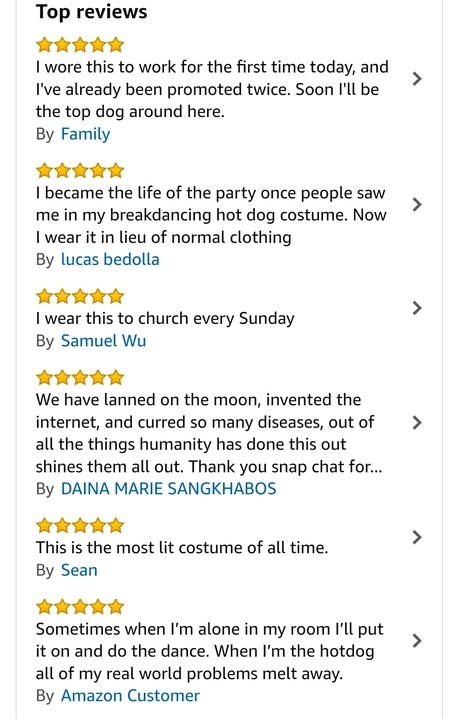 The real genius of Snap's hot dog meme costume HAS to be the reviews. We just wanted to see what people thought of the ensemble but we didn't expect the review section to be SO iconic. Personally, I think church would be exceptionally lit if everyone in the congregation wore this as their Sunday best. It's official. Halloween = sorted.